Sergey Shvetsov, First Deputy Chairman of Russia’s central bank, the Bank of Russia … provided an update on an important development involving the Russian central bank in the worldwide gold market, and gave further insight into the continued importance of physical gold to the long term economic and strategic interests of the Russian Federation. Firstly, in his speech Shvetsov confirmed that the BRICS group of countries are now in discussions to establish their own gold trading system. As a reminder, the 5 BRICS countries comprise the Russian Federation, China, India, South Africa and Brazil. Four of these nations are among the world’s major gold producers, namely, China, Russia, South Africa and Brazil. Furthermore, two of these nations are the world’s two largest importers and consumers of physical gold, namely, China and Russia. So what these economies have in common is that they all major players in the global physical gold market. Shvetsov envisages the new gold trading system evolving via bilateral connections between the BRICS member countries, and as a first step Shvetsov reaffirmed that the Bank of Russia has now signed a Memorandum of Understanding with China (see below) on developing a joint trading system for gold, and that the first implementation steps in this project will begin in 2018. Interestingly, the Bank of Russia first deputy chairman also discounted the traditional dominance of London and Switzerland in the gold market, saying that London and the Swiss trading operations are becoming less relevant in today’s world. He also alluded to new gold pricing benchmarks arising out of this BRICS gold trading cooperation. BRICS cooperation in the gold market, especially between Russia and China, is not exactly a surprise, because it was first announced in April 2016 by Shvetsov himself when he was on a visit to China. China has also been looking into ways to back its currency with gold as a way to push aside the USA dollar, which some have called the petro-dollar (watch US Dollar being challenged by Gold-Petro-Yuan). 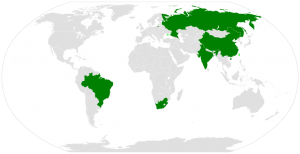 The BRICS nations represent about 40% of the world’s population. Many non-BRICS nations are also working to dethrone the US dollar as the world’s reserve currency. What happens to the US economy if the Dollar is no longer the reserve currency of the world? If US T-bills lose their attraction as reserve investments … it would get harder for the Treasury to sell more of them, requiring higher interest rates to be paid and potentially forcing austerity measures on the US government or triggering classic deficit spending inflation (“printing money” to pay for government, this doesn’t happen now because the deficit is financed through sales of those bonds at extremely low interest rates). The above is warning about inflation, higher interest rates, and troubles borrowing. The USA is the most highly indebted nation of all time. The USA has been essentially on a borrowing binge the last four decades and its economy is now dependent upon borrowing. The Bible paints an even worse scenario that in the time of the end (Habakkuk 2:2-3) the highly indebted will be taken over (Habakkuk 2:2:6-8) and destroyed (Daniel 11:39; USA in Prophecy: The Strongest Fortresses). 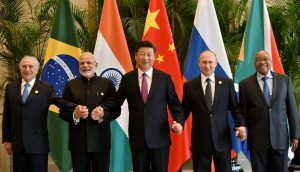 Part of the objective of the BRICS, EAEU, and SCO (Russia or China is in each of those groups) is to establish a new world order (SCO, EAEU, and BRICS defining a ‘new world order’? )–an order no longer dominated by the USA and its Anglo-Saxon allies. We are currently in the time of Anglo-American dominance–peoples that were prophesied to take on Jacob’s name in Genesis 48. We have been in that time since around the start of the 19th century. Yet, now we are getting closer to the final Time of the Gentiles. And their holy places shall be defiled. This will happen during a period that “it is the time of Jacob’s trouble” (Jeremiah 30:7) and that the “Gentiles” are dominating. This means those that are descended from Israel or have the name of Jacob (cf. Genesis 48:14-16) will be mainly the ones who are trampled on. One of the peoples that God says He will use to punish the descendants of Israel, Assyria (Isaiah 10:5-11), are a Gentile people–they will normally lead during the time of the Gentiles. This will be a terrible time. For the final time of the Gentiles to arise, the Gentiles will need to cooperate together against the USA and its Anglo-Saxon descended allies. The BRICS, EAEU, SCO, and Silk Road arrangements are all intended to do that and are all taking steps which align with properly understood biblical prophecies. Even the European Union is working on this. The Bible also shows that a block of nations from North Africa and the Middle East will also be involved (cf. Daniel 11:27, 40-43)–this is something that US President Donald Trump and others have encouraged (see How Will Middle East Peace be Brought About?). Yet, most in the USA, Canada, UK, Australia, and New Zealand do not understand what is now happening on the world scene and how they will be affected. The world will be transformed into a Gentile image. An image that those in the Anglo-American nations will dread! Post Brexit Prophecy On June 23, 2016, the voters of the United Kingdom of Great Britain and Northern Ireland (UK) chose to leave the European Union. Now with this BRitish EXIT (Brexit) vote, what is prophesied to happen to the UK? Will the UK do well or be taken over and made slaves? Dr. Thiel explains from biblical prophecies what is ahead for the UK, Europe, and even the USA, Canada, Australia, and New Zealand. Does God Have a 6,000 Year Plan? What Year Does the 6,000 Years End? Was a 6000 year time allowed for humans to rule followed by a literal thousand year reign of Christ on Earth taught by the early Christians? Does God have 7,000 year plan? What year may the six thousand years of human rule end? When will Jesus return? 2026 or 20xx? There is also a video titled The 6000 Year Plan: Is the end of humanity’s reign almost up? This entry was posted on Saturday, December 2nd, 2017 at 1:00 pm	and is filed under Prophecy. BRICS proposing their own development bank. A prelude to the time of the Gentiles? China’s ‘petro-yuan’ successfully introduced; Why is Russia accumulating gold?